Make your way to the MGM Grand on the Las Vegas strip for a shuttle to the drop zone (if option chosen at time of booking). You'll meet your instructors and go through a safety briefing and orientation. Get fitted for a harness, jumpsuit, helmet and goggles. Your instructor will check and double-check all of your equipment before you board the plane. Enjoy the feeling of anticipation as the plane takes off, then gaze out the windows for views of the Strip and all its bustling activity, Red Rock Canyon and Mount Charleston. Once the plane reaches jumping altitude, approximately 2 miles above the earth's surface, you'll do one final equipment check and latch on to your instructor via 4 attachment points. Once the door opens, you'll be airborne. Fall for 45 seconds at speeds up to 120 mph (193 kmh). At just the right time, your instructor with deploy the parachute and you'll both glide peacefully towards the planet's surface. This was an excellent tour. Staff was professional and top notch. Everything from the plane ride up to the final moment dangling out the side of the plane before you fall was a blast! I would do this tour again in a heartbeat. Another thing ticked off my bucket list and I'm so glad I chose to do it here! From being picked up to being dropped off, it was amazing! Cannot explain the feeling a skydive gives you! Tommy was my instructor and was brilliant, felt very safe! An experience I'll never forget! Photos were brill too. Had a great time skydiving. The shuttle for pickup was on time. I had trouble finding the pickup location but after calling they were patient and gave helpful directions. After being dropped off at the office we were assigned instructors. They helped us put on all the equipment and told us instructions on what to do on the plane when the door opens, what to do while skydiving, and how to land properly. My instructor, David, talked me through the entire process. Even while on the plane I didn't feel nervous since David continued to give instructions and made friendly conversation. 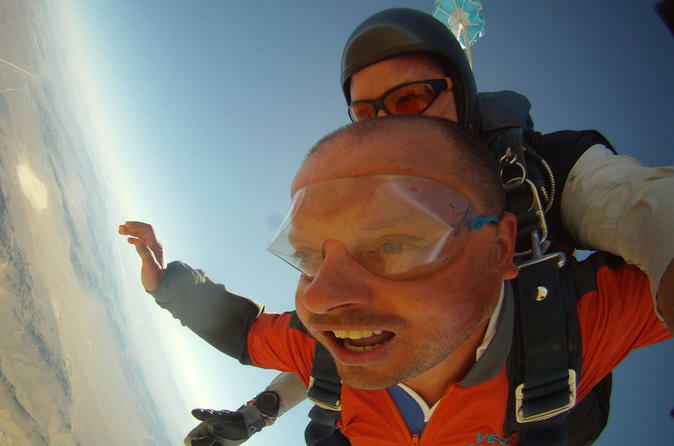 The skydiving experience itself is like no other and you have great views of the mountain ranges. Overall I'd definitely recommend this company to anyone who would like to try skydiving. Awesome experience and a great team of instructors. The pick up and drop off was seamless and they really kept us in the loop with whats going on. Will definitely recommend them to anyone. My husband did the skydive whilst we were in Vegas. He thoroughly enjoyed it. He's so glad he did it! Wonderful instructors, wonderful staff, wonderful experience. I already want to jump again. Thank you guys! Just breathtaking! One of the best experiences ever. The guys are really friendly and jokey which helps to calm you slightly. You have no time to think when your in the plane as your quick out the door and descending. Incredible! The most exhilarating experience of our lives!! The misses and I are thrill seekers but had never been thrown out of a plane at 15,000ft strapped to a guy we'd just met before - so we booked this. The team here are great and professional. They run you through a safety briefing and get you on a bench to practice you positioning for when you finally jump. There are lockers for your belongings and they allow you to bring your own GoPro cameras but trust me when I say pay the little extra for them to film your jump. They keep you laughing through your nerves and when it comes to the point of jumping they confirm with you whether you want to do it - if not you get a refund which I thought was awesome for them to offer but nonetheless make sure you jump as it will be the best experience ever! !